Invasive Species in Minnesota have become a huge issue for our 10,000 lakes. More and more individuals are trying to stop and prevent their presence in our lakes. This is because as invasive species develop a superior existence within the lakes, there are less resources and space for native weeds and animals. Consequently, it will diminish the amount of inherent weeds and animals that are meant to be in that specific lake and keep the ecosystem balanced. There are many methods that one can use to try and stop these species from spreading and, ultimately, taking over lakes. But, before you can address how to get rid of them, you need to understand them. This blog post will help inform you of a few different types of invasive species in Minnesota. Eurasian Watermilfoil is located in numerous lakes across the state. It is well known as being a common nuisance among different lakes. 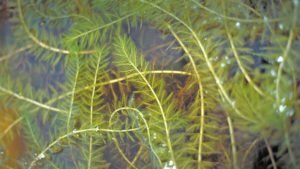 To know how to distinguish it from other plants, Eurasian Watermilfoil grows toward the surface of the water and has characteristics that make it look like a strands of tangled stems. It also appears to look like a mat that is laying on the top of the water. This plant populates quickly because if a part falls off of the stem, it can settle and grow new roots. That is why it has become a major problem for many lakes. Once it is found it can repopulate rapidly. To learn more about Eurasian Watermilfoil, click here! 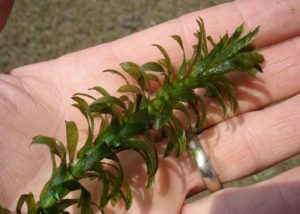 Curly-leaf Pondweed is the chameleon of the invasive species in Minnesota. It appears to be reddish-brown in the water, but once you pull it out, you can see that it is actually green. The leaves of this plant are also what makes it stand out from other lake weeds. They are medium length and have sharp, serrated edges. This plant is also one that is rooted in the ground and can be growing in up to 15 feet of water. 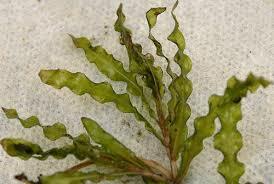 To learn more about Curly-leaf Pondweed, click here! Brittle Naiad has a more “bushy” appearance. This is because the leaves are clumped together at the top of the stem. The leaves are pointed, come out of the top of the plant, and have a drooping look. 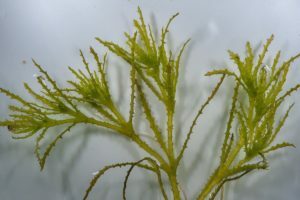 It is a submerged plant that posses a greenish color. There are currently six different lakes that posses this invasive species. It is a danger to Minnesota lakes because it steals food and lake bottom from the native plants. Therefore, the indigenous plants will not be able to survive and the lakes’ ecosystems will not be stable. To learn more about Brittle Naiad, click here! Starry Stonewort reflects similar characteristics to Chara, but it Chara is native and Starry Stonewort is invasive. Chara is native because it provides necessary nutrients and protection for fish and other animals living in the lake. Starry Stonewort, on the the other hand, does not provide the same benefits. Both Chara and Starry Stonewort are developed forms of algae. Therefore, they do not have all the same elements as normal plants. It is a common misconception that these are plants, but that is not the case. 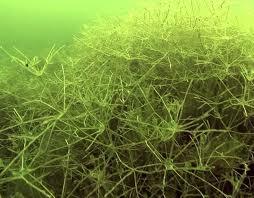 To learn more about Starry Stonewort, click here! Brazilian Elodea originates from South America. It is the least common to see out of all the other invasive species in Minnesota. This is because it is mostly found in the southern and eastern parts of the United States. However, it has been found in Minnesota. This invasive species also competes with other native plants and animals for life. It does not provide a suitable area for fish or other animals to take protection because it can grow to be very long. This plant is dissimilar from the other invasive species in Minnesota that are listed because it can be rooted or floating. To learn more about Brazilian Elodea, click here! Zebra Mussels have become very popular in today’s water talk. They are little mussels with very sharp shells. This is where they become a safety hazard for people when they are swimming or standing in water. Zebra Mussels are also harmful because they attach themselves onto rocks, boat lifts, boat motors, and basically any hard or solid object. They are threatening for their hazardous shells, but they can also ruin people’s boats by getting into the motor. This results in the pipes of boats getting clogged with these invasive animals and bursting the pipes. Along with being painful, Zebra Mussels are also known for making lakes incredibly clear. This is because they filter the water by feeding on algae. From a distance, this may not appear to be a bad characteristic, but the algae is important for other parts of the lakes’ ecosystems. Other fish and animals rely on the algae for food. 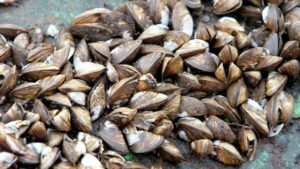 Lastly, Zebra Mussels are also known for causing problems with the ecosystem because they attach themselves to anything hard and, eventually, will take the object over. This may not seem like an immense concern for objects like rocks that are not alive. But, they also attached themselves to objects that are living. For example, they are known for killing off other mussels and plants when an abundance of them attach themselves to the live object and completely taking it over. That is another one of the many reasons that Zebra Mussels are seen as a dangerous invasive species. To learn more about Zebra Mussels, click here! To learn more about Invasive Species in Minnesota, click here!